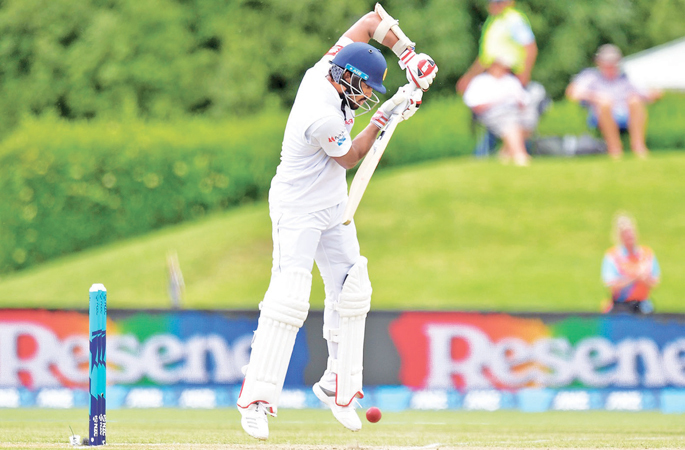 Dinesh Chandimal batting against New Zealand in the second innings of the Christchurch Test where he made a patient half century. Sri Lanka’s chairman of cricket selectors Ashantha de Mel said that apart from finding a batsman to replace the injured Angelo Mathews they also need to find an opening partner for Dimuth Karunaratne for the upcoming two-Test series against Australia later this month. Mathews has been ruled out for four weeks with a grade two strain on his left hamstring which he picked up while batting in Sri Lanka’s second innings of the second Test against New Zealand at Christchurch last week. The injury effectively reduces his chances of playing in the two Tests in Australia. De Mel also disclosed that they had an issue with the openers’ slot. Danushka Gunathilaka who was given the task of opening with Dimuth Karunaratne flopped in New Zealand. He failed to get to double figures in any of his four Test innings. “Dimuth is a good opener it was very unfortunate in the second innings at Christchurch he nicked one down the leg side. He has scored a lot of runs in the year. We need to find one more opener who is steady. A batsman who can stay and take the shine off the ball and keep the top order from coming in within the first two overs,” said De Mel. “There are players but we can’t do a fishing expedition we have to give them a little time. Even Kaushal Silva is not a bad opener. His defence is quite good and he can stay at the wicket for a long time. We need somebody with good technique and when you start playing with the pink ball it will start moving around. We can expect a lot of bounce from the Australians, they know that we are susceptible to the short ball. We must be able to counteract it,” he said. Sri Lanka’s opening Test at Brisbane on January 24 will be a night game played with pink balls. De Mel was of the view that skipper Dinesh Chandimal should bat at number three. “I think Dinesh Chandimal is a person who should bat at no. 3. He bats too low. If he is the captain he must take the bull by the horns and bat at 3. He batted for about 324 minutes and he was good. He made 56 but he stuck in there. We need somebody who is solid like the Pujara mould who can go in and bat for long periods basically take the shine off and wear the fast bowlers down rather than keeping them fresh with wickets,” said De Mel. Sri Lanka has been struggling to find a permanent no. 3 since Sangakkara quit international cricket three years ago. “When two players like Sanga and Mahela (Jayawardene) play for 15-20 years you don’t build. It’s like Murali bowling for ten years where there is no chance for another spinner to come and develop. When they leave the gap is too big to fill it’s a big vacuum. See Australia today their batting is so weak. Like us they are also struggling. When really good players play for long years and retire almost at the same time it’s not easy to fill at once. It will take time because they have to slowly establish themselves. Even Sanga when he first came in had to establish himself gradually. A little of patience is required,” De Mel said. It is blatantly obvious that SL batsmen cannot play short pitched bowling with confidence. Why do we not use bowling machines fpr long spells to practice against short pitched bowling? No idea why the best batsman in the team, Mathews, bats very low down the order when he should be batting at number 3 or 4. The basic problem lies in the structure of the SLC tournament set up. There should be no more than 10 teams in the Premier League. We currently have over 20 teams some of them would have struggled to compete against school teams of the 1960s and 1970s. Come on SLC wake up! !